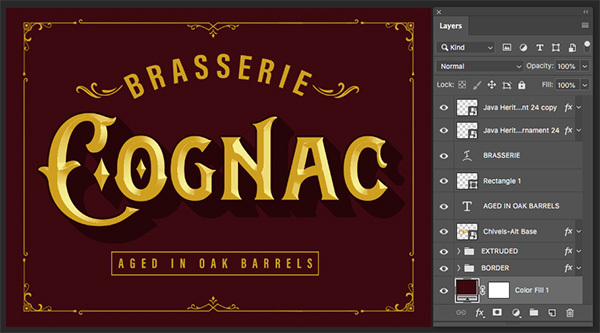 In this tutorial we will be creating an advertisement for Brasserie Cognac in Photoshop. 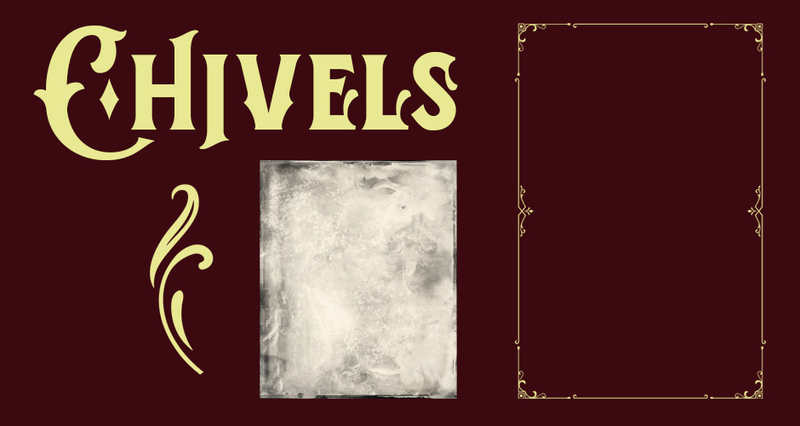 To do this we will be making a label design using a sample of the beautiful ‘Chivels’ typeface from AF Studio, ornaments and decorative elements from Heybing Supply Co, and textured template from Photo Spirit all taken from The Creative’s Ultimate Vintage Collection. This all new collection contains a huge assortment of vintage design elements from artists such as Blue Line Design, Mr Vintage, Paper Farms, Tobias Saul, and many more! 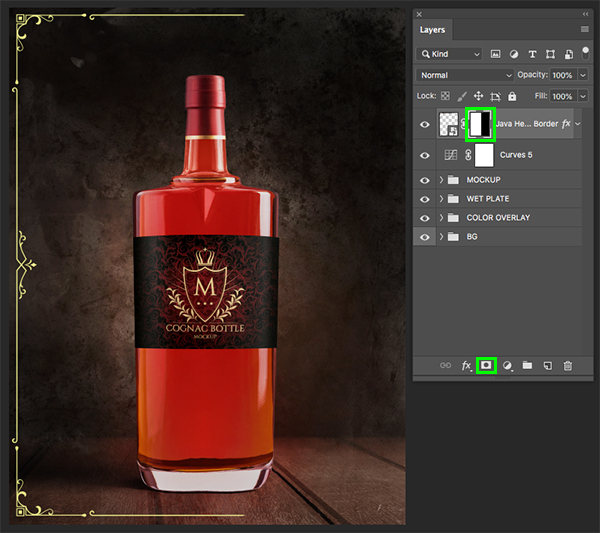 We will also be using a realistic looking bottle mockup that will be featured in the ad with our custom label design applied. The Creative’s Ultimate Vintage Collection has been lovingly crafted to make creating convincing and beautiful retro art easy! If you are all ready to begin then fire up Photoshop and let’s get started! This freebie pack is just a small sample of what you can expect to find in The Creative’s Ultimate Vintage Collection for just $29 (that’s 99% off). This is the ultimate library of hand-crafted vintage resources for all your retro design needs! Now that we have removed the extraneous layers, let’s move down to the ‘BG > Texture’ folder and select the main texture image inside. 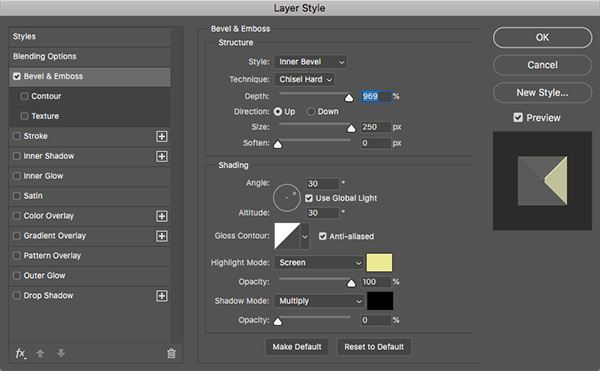 Hold the Alt/Option key and click on the Adjustment Layer icon at the bottom of the Layers Palette and choose ‘Black & White…’ from the list. 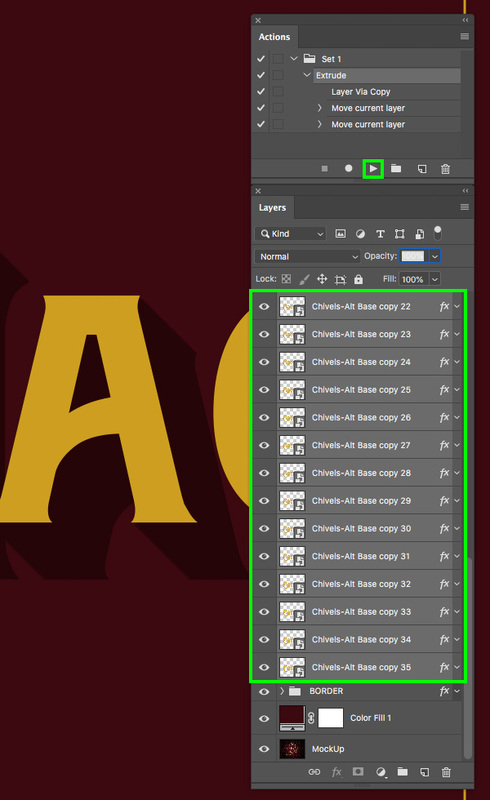 Check off the option that says ‘Use Previous Layer to Create Clipping Mask’ and then click ‘OK’ to continue. 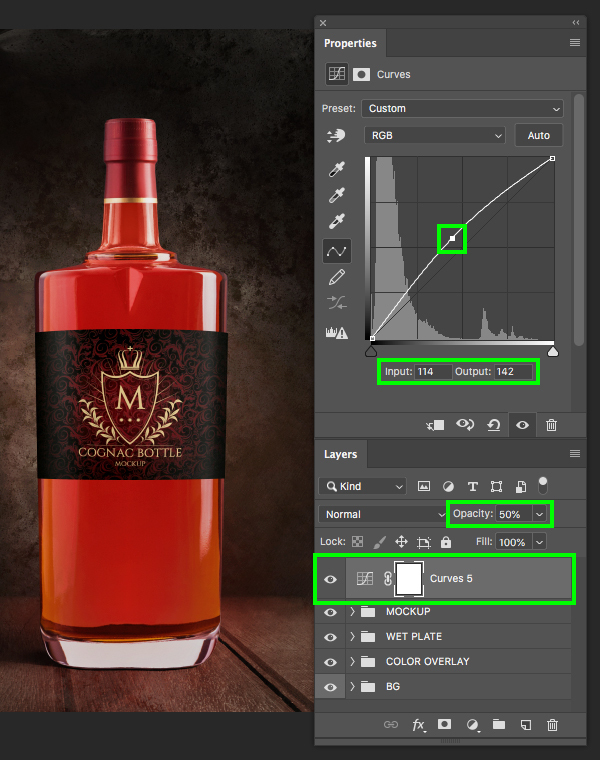 Your background should now be all black and white and you will see the Clipping Mask applied so that the Adjustment Layer only affects the main ‘Texture’ layer that it’s attached to. 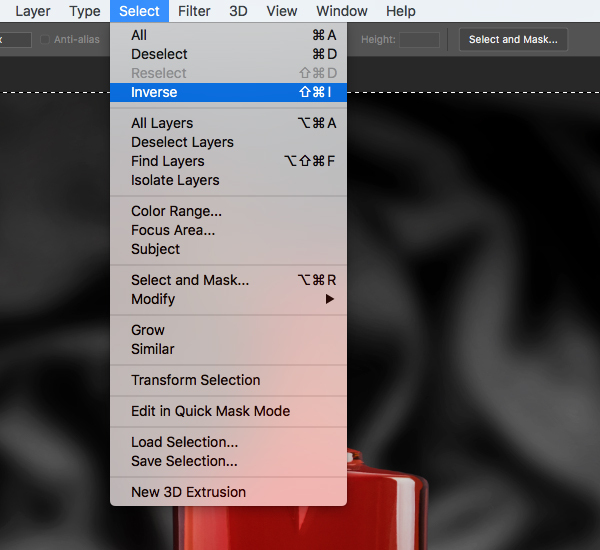 With your selection active and the ‘Texture’ layer still selected, go to the Select menu and choose ‘Inverse’ from the dropdown menu. 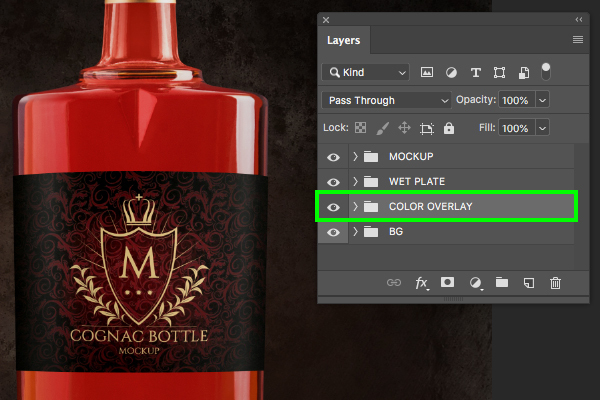 Click the Add Layer Mask icon from the bottom of the Layers Palette to mask out the entire top portion of the background image. 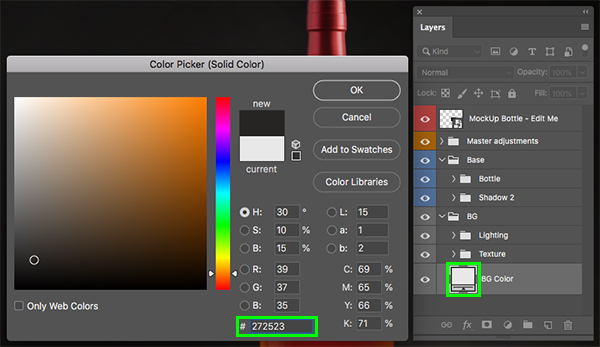 Double click on the ‘BG Color’ thumbnail and change the fill from solid white to ‘#272523’ and then press ‘OK’ or ‘Return’ on the keyboard to proceed. 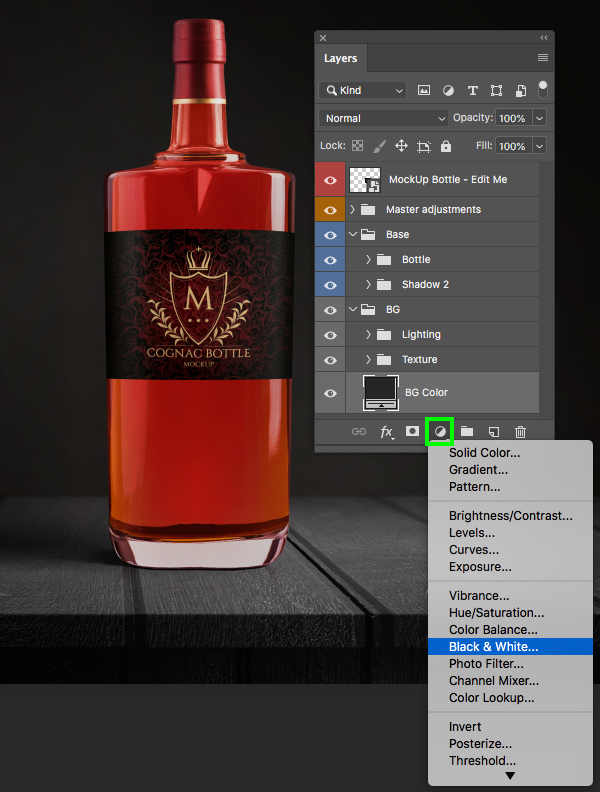 With the ‘BG Color’ layer still selected, click on the Adjustment Layer icon at the bottom and choose ‘Black & White…’ from the menu. 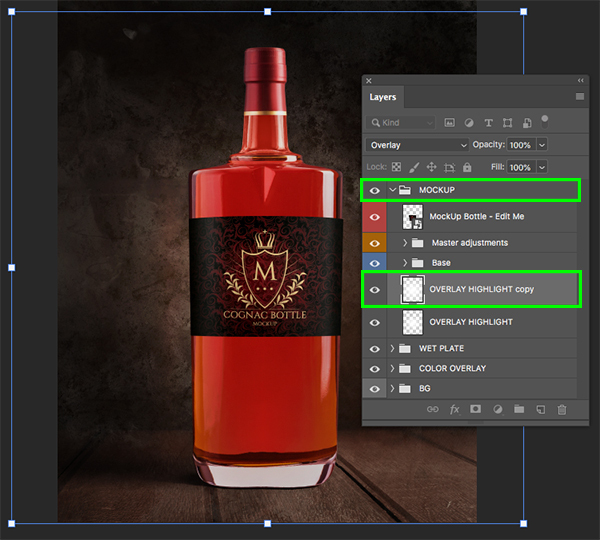 Press ‘C’ on the keyboard to switch to the Crop Tool and then crop your image in the following way before pressing ‘Return’ on the keyboard to apply the changes. Next, go to the freebies folder for this tutorial and locate the ‘Wet Plate Template.psd’ file inside of the ‘Photo Spirit’ subfolder and open it in Photoshop. 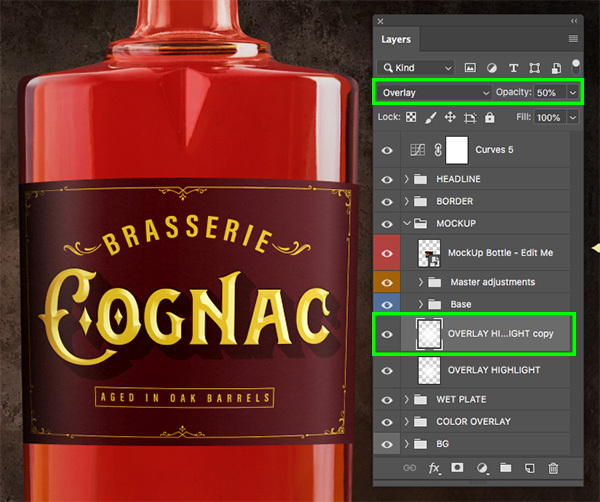 From here, select the top ‘Sepia Effect’ layer, hold the Shift Key and then select the ‘Contrast Effect’ layer so you have both of those folders and all of the folders in between selected at the same time. 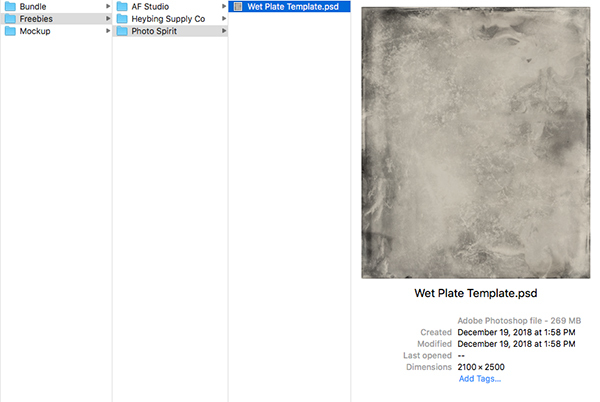 After dropping the folders into the mockup, press Command/Ctrl+G to place them into a folder and rename it ‘WET PLATE’. From there, press Command/Ctrl+T to do a Free Transform and then scale the entire ‘WET PLATE’ folder up while holding Alt/Option+Shift on the keyboard to extend it a bit beyond the canvas before pressing ‘Return’ on the keyboard to apply the changes. 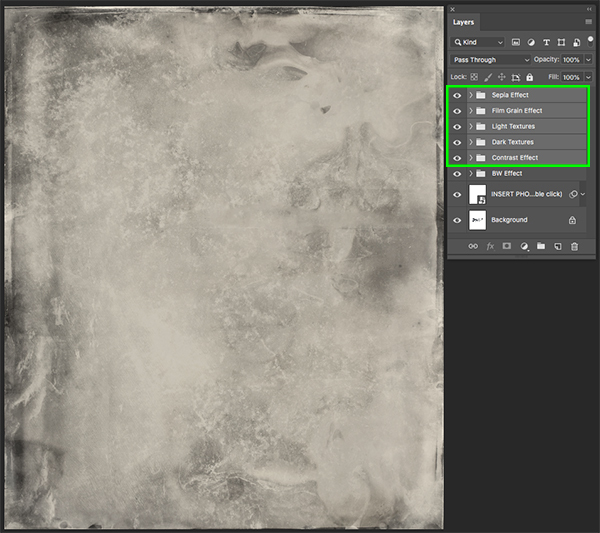 Create a new layer just above the ‘WET PLATE’ folder and then click and drag outwards from the center of the canvas to create a large white gradient. 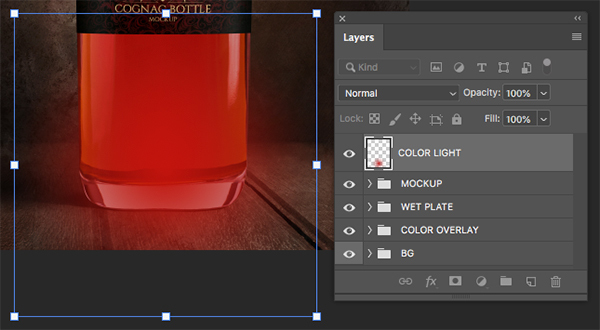 Let’s double click on the layer name here and rename it ‘OVERLAY HIGHLIGHT’ as well. 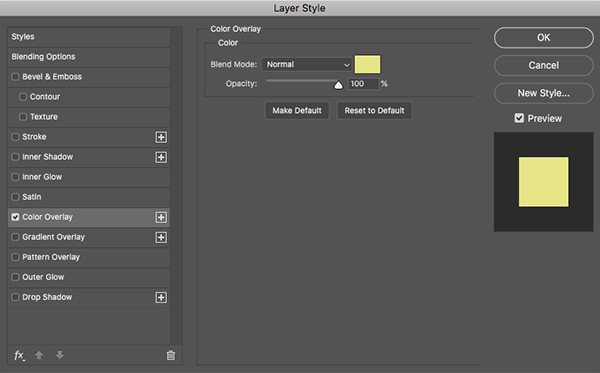 Change the Blending Mode of the layer from ‘Normal’ to ‘Overlay’. 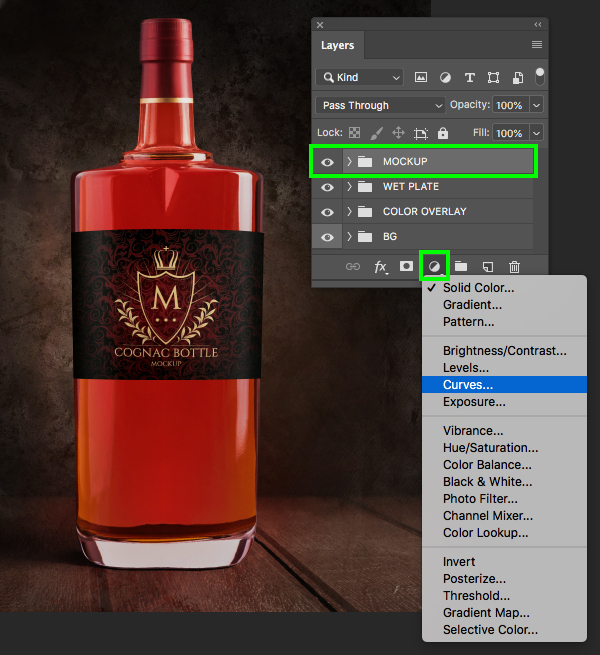 Select the very top ‘MockUp Bottle – Edit Me’ layer and then hold the Shift Key and select the ‘OVERLAY HIGHLIGHT’ layer that we just created. 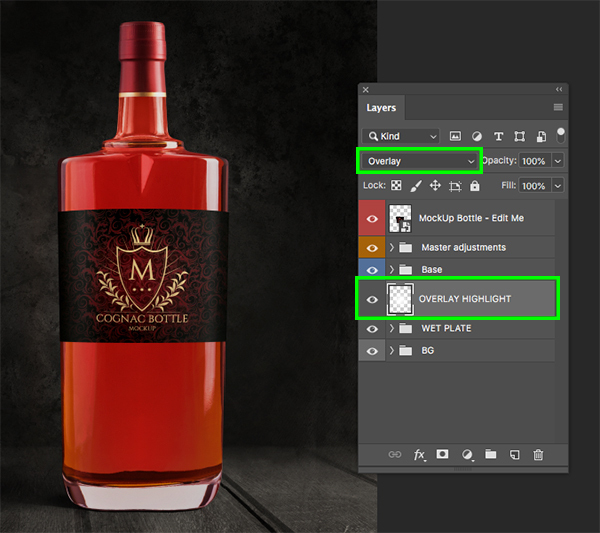 With all of your layers and folders still selected, press Command/Ctrl+G to place them into a new folder and double click on the folder name to rename it ‘MOCKUP’. 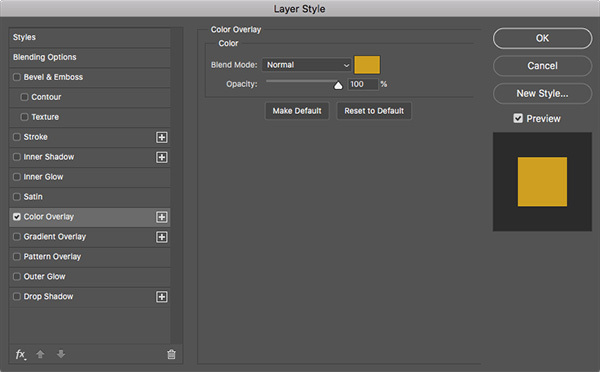 Let’s give our plain black and white background a tint by selecting the ‘BG’ folder at the bottom of the Layers Palette and then clicking on the Adjustment Layer icon where we want to choose ‘Solid Color…’ from the dropdown. Use the hex value ‘#9D2D0A’ and then press ‘Return’ or click ‘OK’ to continue. 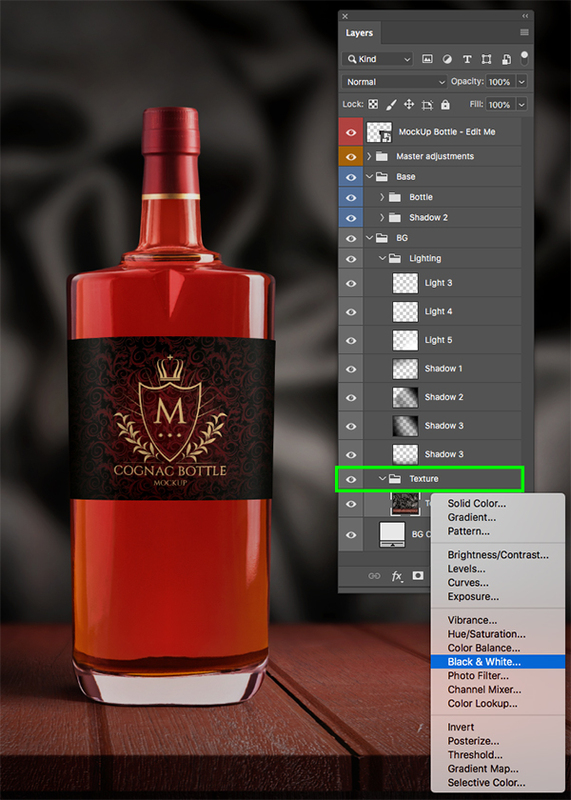 Let’s give our backlight an extra boost by going into the ‘MOCKUP’ folder and then selecting the ‘OVERLAY HIGHLIGHT’ layer. Press Command/Ctrl+J to duplicate the layer and then apply a Free Transform (Command/Ctrl+T) and scale the highlight up from the center by dragging outwards from any of the four corners of the bounding box while holding Alt/Option+Shift on the keyboard. Once you have done that, press ‘Return’ to apply the changes. 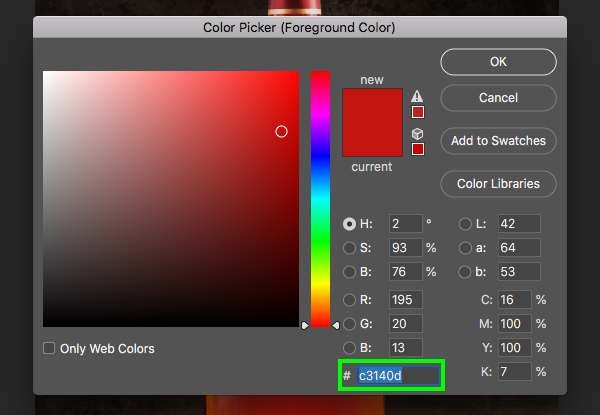 Change your foreground color to ‘#C3140D’ and then press ‘OK’ to continue. Press ‘G’ to once again select the Gradient Tool and use the same solid to transparent Radial Gradient that we used earlier. This time, however, you should have your bright reddish orange color selected instead of white. Next, let’s change the Blend Mode from ‘Normal’ to ‘Soft Light’ and drop the ‘Opacity’ down to ‘80%’. 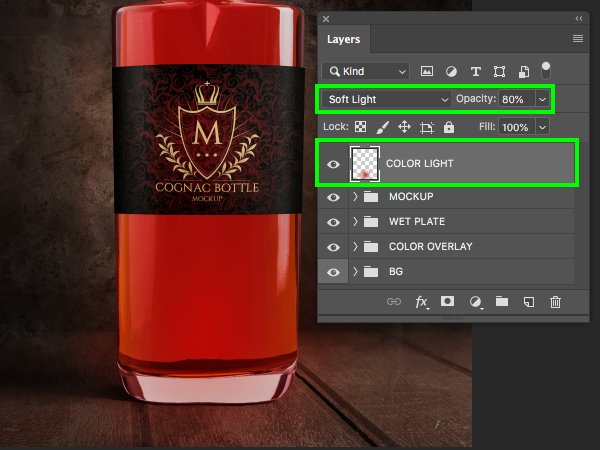 Once you have done that, double click on the layer name and rename it ‘COLOR LIGHT’. 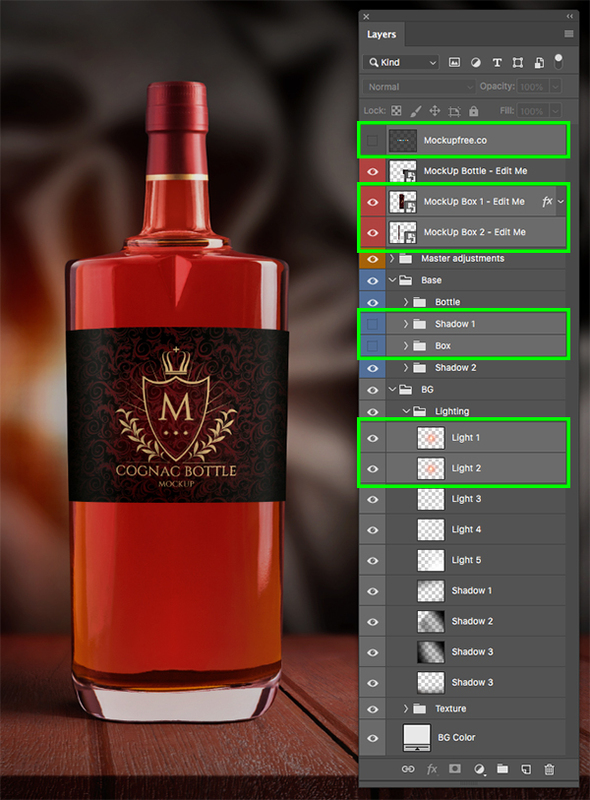 With your ‘COLOR LIGHT’ layer selected, expand the contents of the ‘MOCKUP’ folder and then go down even further into the ‘Base > Bottle’ folder and locate the main ‘Bottle’ layer all the way down. 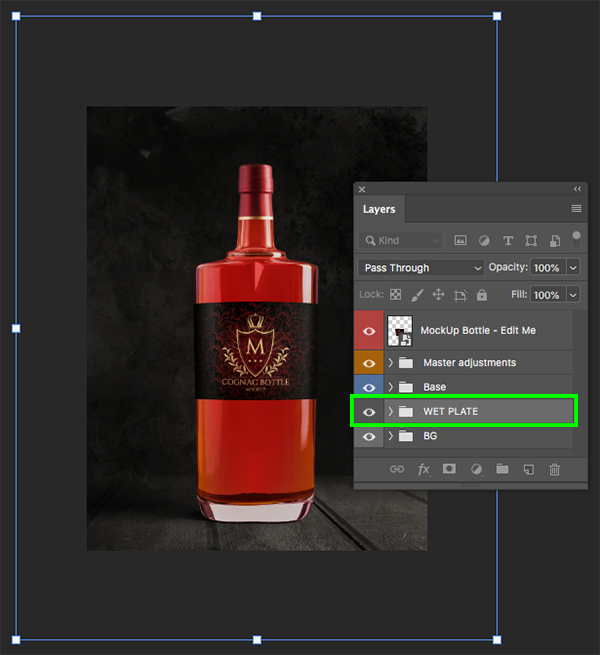 Once you have located the layer, hold the Command/Ctrl key and click on the layer thumbnail icon to activate a selection around the shape of the bottle. 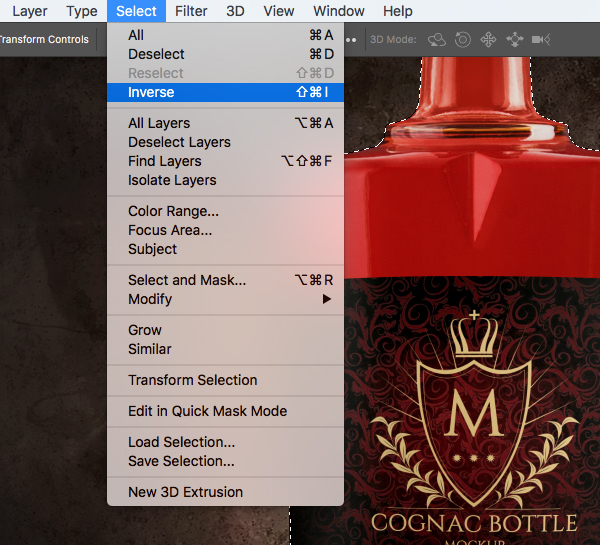 With your selection active, go to the Select menu and choose ‘Inverse’ to invert the selection. 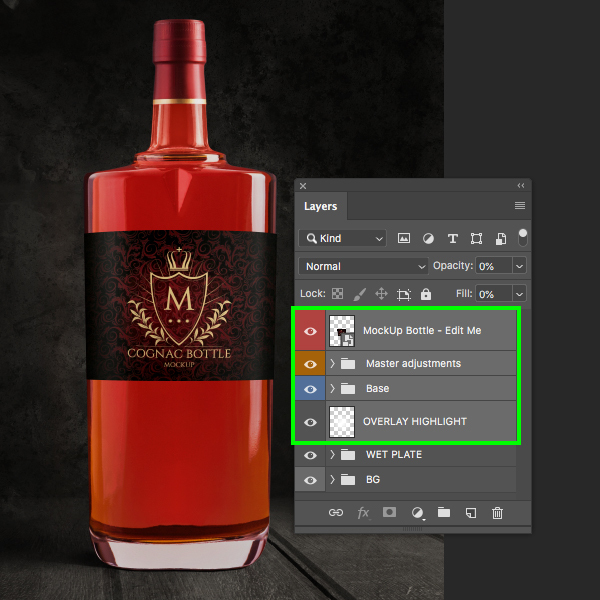 Select the top ‘MOCKUP’ folder in the Layers Palette and then click on the Adjustment Layer icon at the bottom before choosing ‘Curves…’ from the dropdown menu that appears. Add a point in the center of the grid where the ‘Input’ is set to ‘114’ and the ‘Output’ is set to ‘142’. 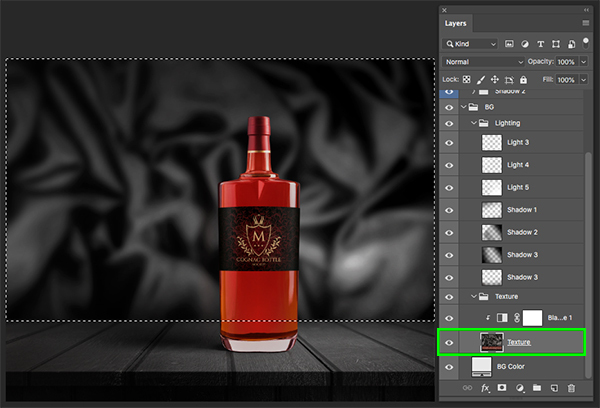 Doing this will brighten up the image overall while adding a bit more contrast. 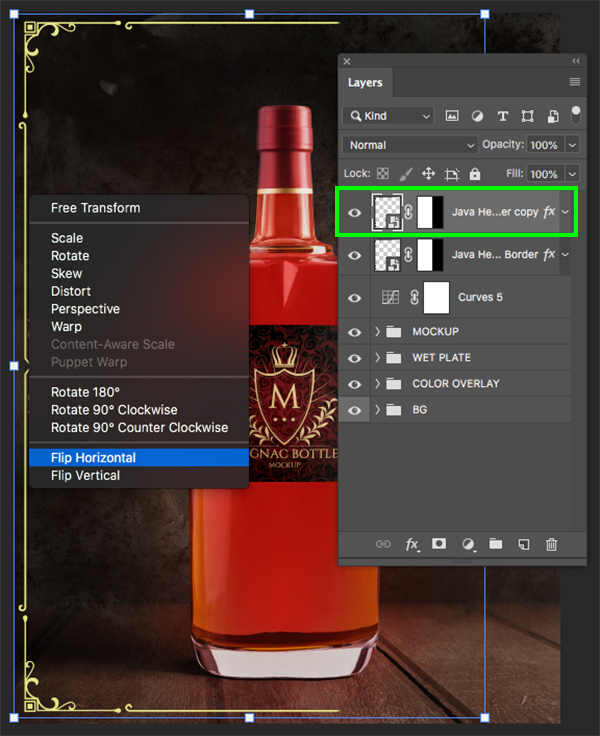 Once you have done that, reduce the ‘Opacity’ of the Adjustment Layer down to ‘50%’. 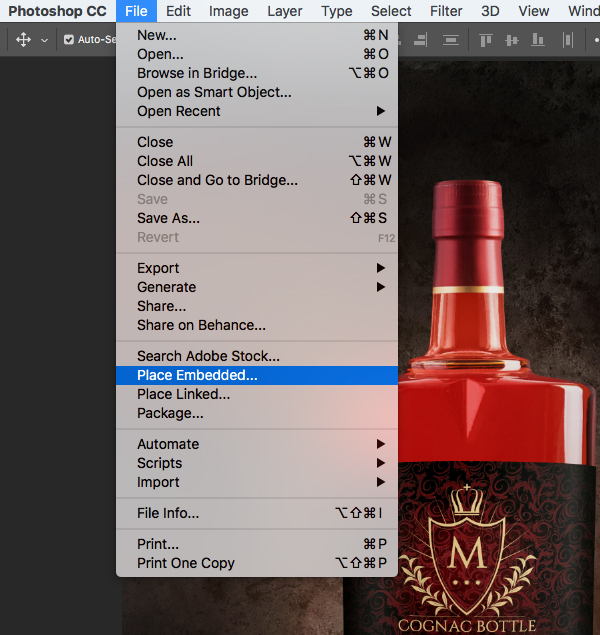 Go to the File menu and choose ‘Place Embedded…’ from the list. 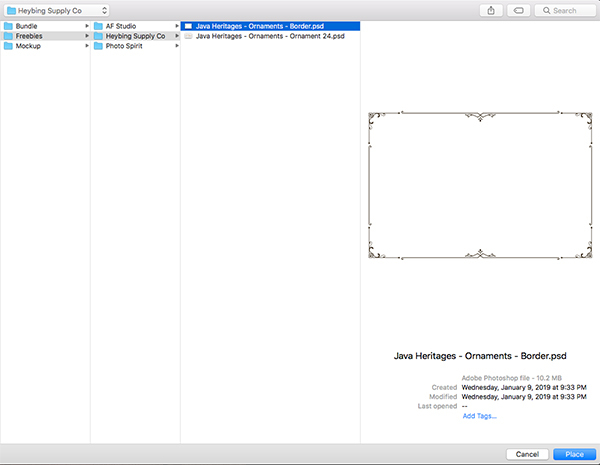 Navigate to the ‘Java Heritages – Ornaments – Border.psd’ file from Heybing Supply Co and then choose ‘Place’ to bring it into the document. Hold the Shift key and drag outwards until the frame fits nicely vertically – it won’t be the right width but we will fix that in a moment. 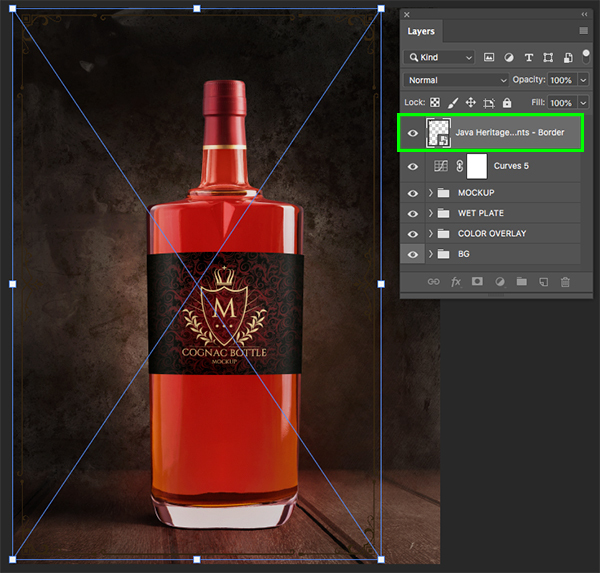 Once you have placed the border, press ‘Return’ to apply the transformation. 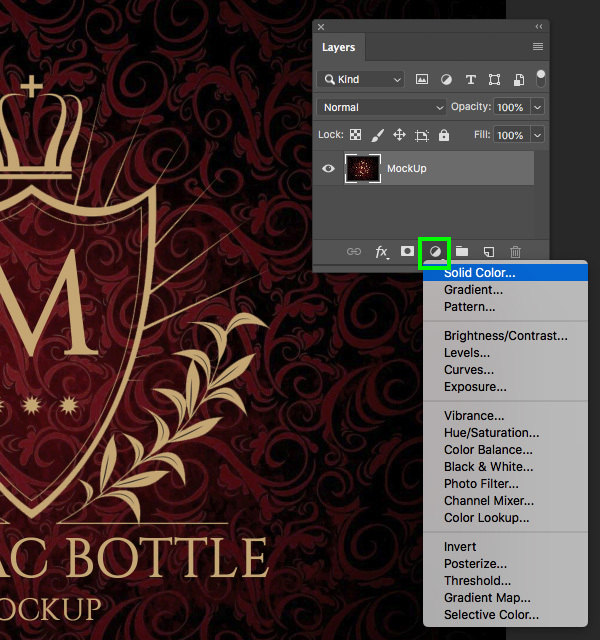 Double click on the border graphic and apply a ‘Color Overlay’ in the Layer Style panel. 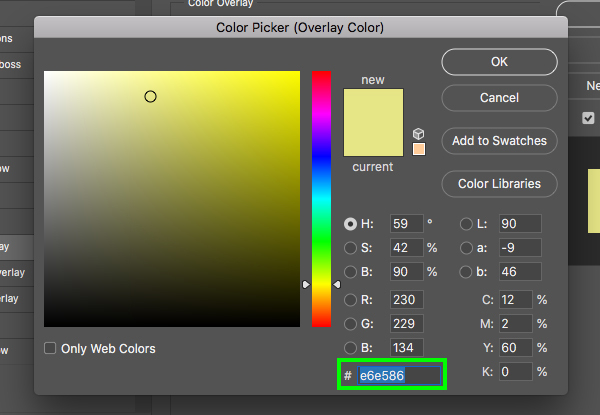 For the fill color, let’s use the hex value ‘#E6E586’ and then press ‘OK’. Select the masked border layer and press Command/Ctrl+J to duplicate it and then press Command/Ctrl+T to initiate a Free Transform. 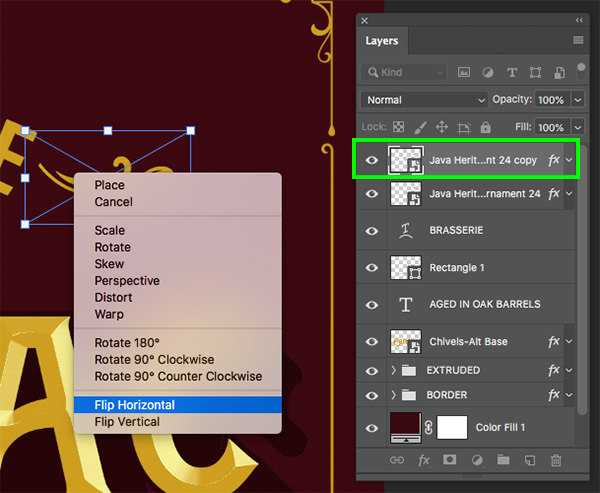 From here, hold the Control key and click anywhere on the duplicate border layer to reveal a dropdown menu where we want to select the ‘Flip Horizontal’ option. After flipping the border horizontally to mirror the original layer, hold the Shift key and slide it over to the opposite side so that the border now covers the entire perimeter of the image. Once you have done that, select the top copy, hold the Shift key and then select the bottom copy so that both copies are selected simultaneously. 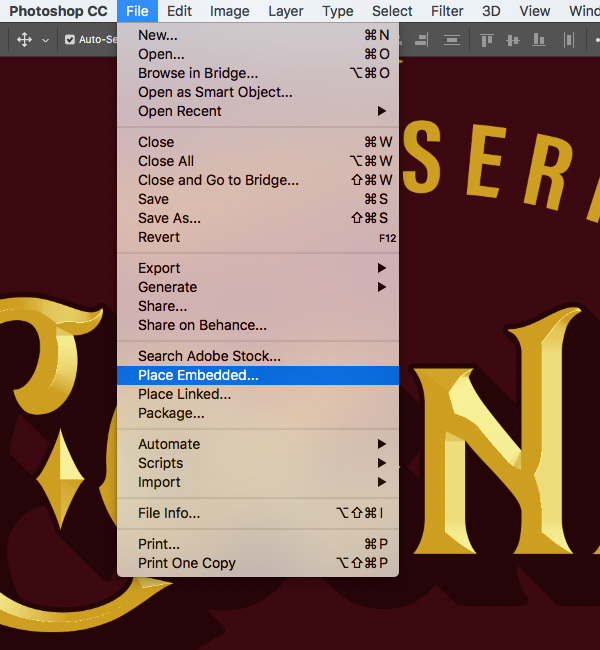 Click two or three times inside of the text box to highlight the copy and then click on the ‘Create warped text’ icon from the top toolbar. 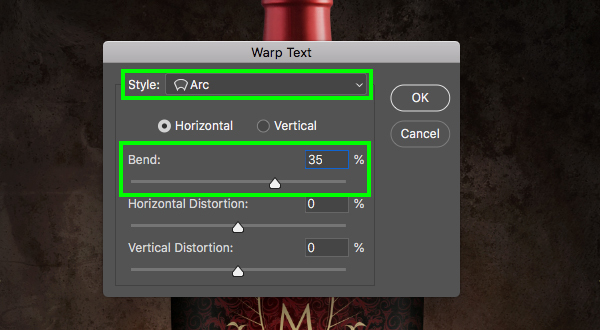 Once you are prompted with the Warp Text dialog box, change the ‘Style’ to ‘Arc’ and then create a horizontal bend to ‘35%’ before pressing ‘Return’ or click ‘OK’ to proceed. This will create a nice arc for our headline that will hug the top of the bottle. Now let’s select the text layer and press Command/Ctrl+G to put it into a folder and double click the ‘Group 1’ text to rename the folder ‘HEADLINE’. 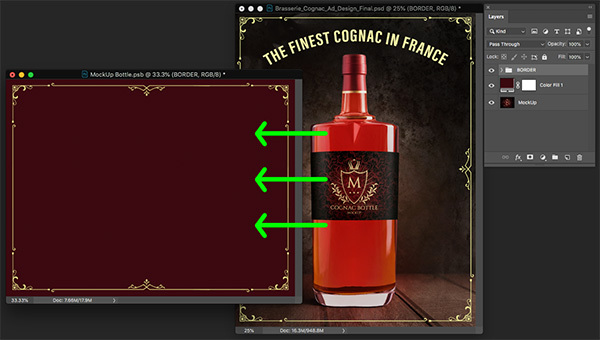 We have now set up the main portion of our ad and customized the mockup for our needs. 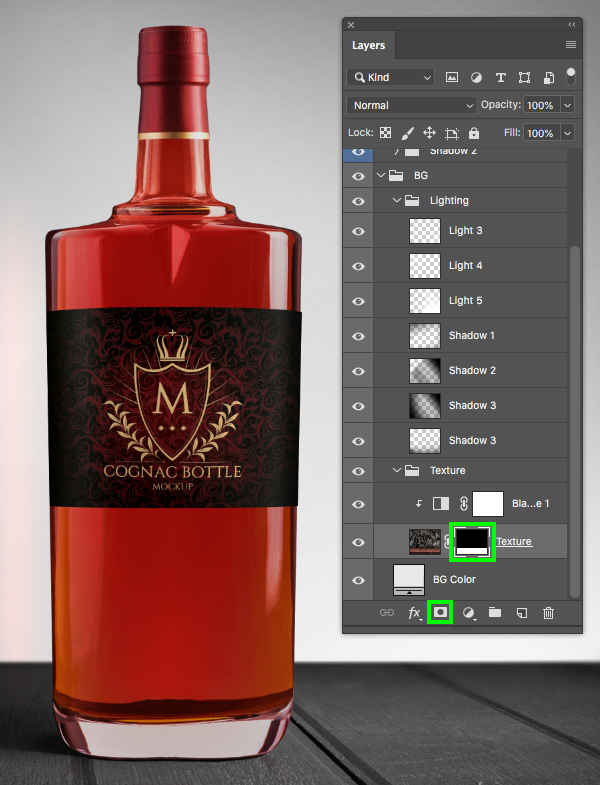 At this point we can begin working on creating our custom label for the bottle! 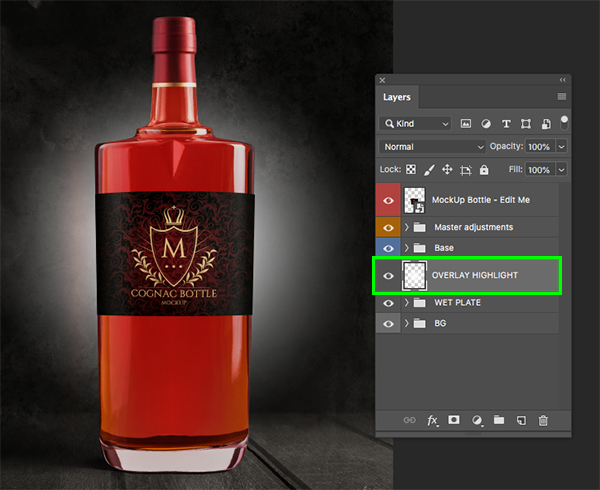 Expand the contents of the ‘MOCKUP’ folder and double click on the ‘MockUp Bottle – Edit Me’ layer highlighted in red to go inside of the Smart Object. 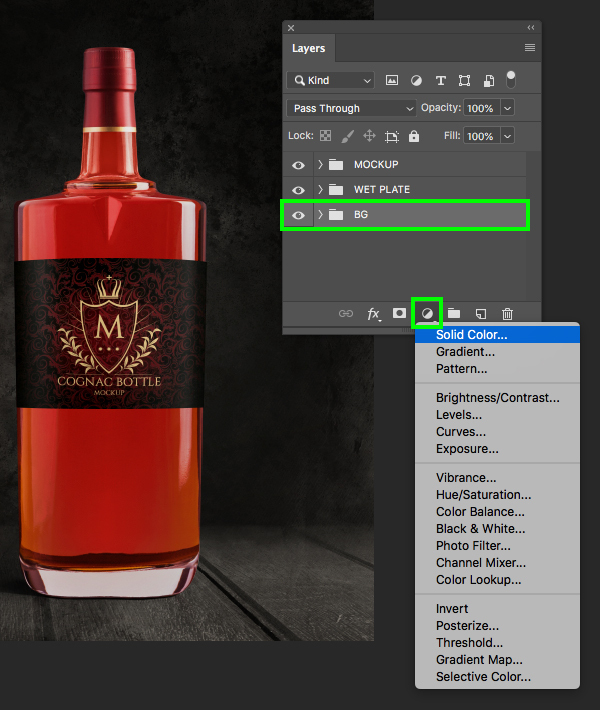 Once inside of the label design, click on the Adjustment Layer icon at the bottom of the Layers Palette and choose ‘Solid Color…’ from the menu. 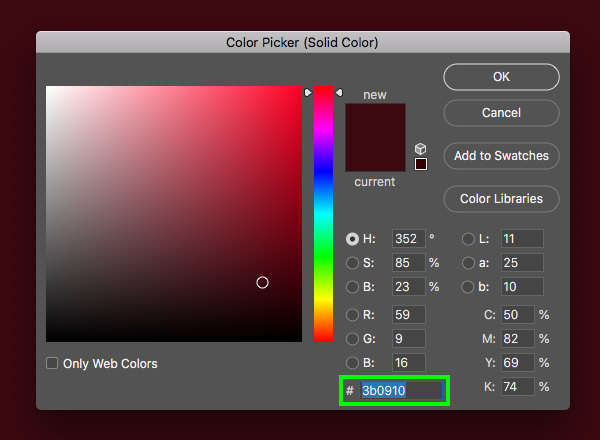 For the fill color, enter the hex value ‘#3B0910’ and then press ‘Return’ or click ‘OK’ to continue. 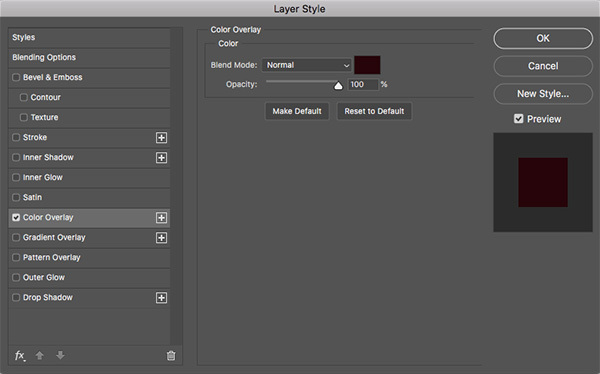 Double click on the ‘BORDER’ folder to open the Layer Style dialog box and check off the ‘Color Overlay’ option. 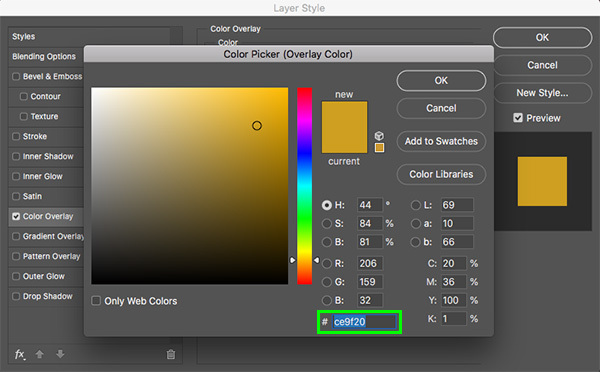 For the fill color, let’s use the hex value ‘#CE9F20’ and then click ‘OK’ twice to apply the changes and close out of both dialog boxes. 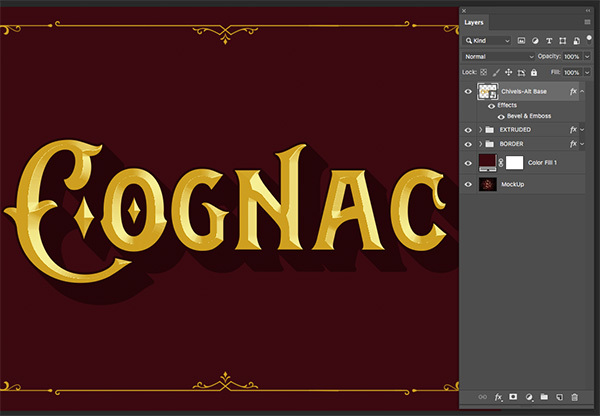 Create a new layer and type out the word ‘Cognac’ using the ‘Chivels-Alt’ in the ‘Base’ style from the freebies folder for this tutorial. This typeface is just one of several styles from AF Studio. Here I have also made the text about ‘116 pt’ with a tracking setting of ‘-20’. 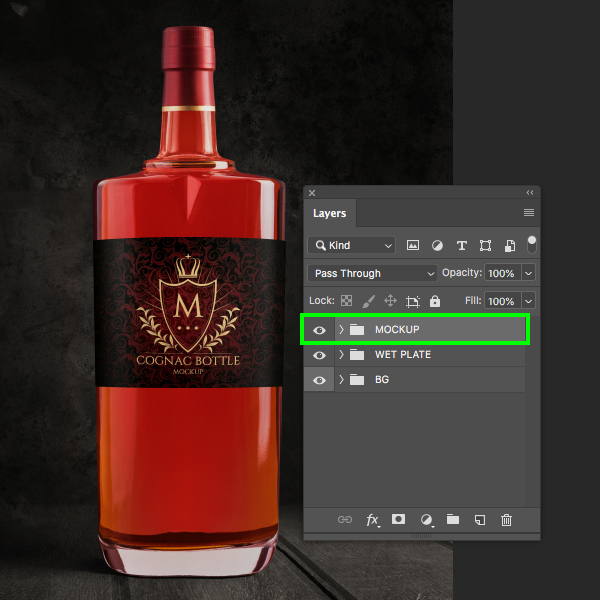 For the fill color, use the same ‘#CE9F20’ from the previous step. Next, hold the Control key and click on the text layer to reveal a dropdown list. 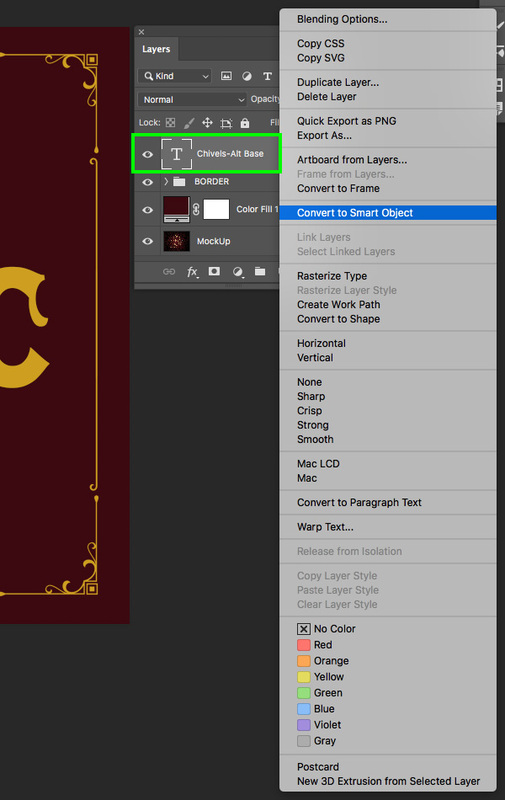 From this list, choose the ‘Convert to Smart Object’ option to convert the text. 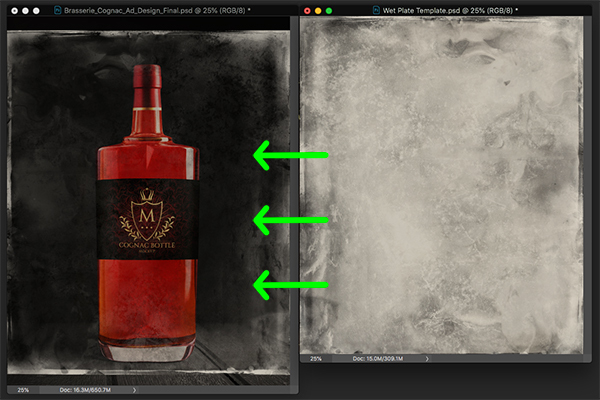 From here, select the Smart Object layer and press Command/Ctrl+J to duplicate it, and then move it below the original copy. 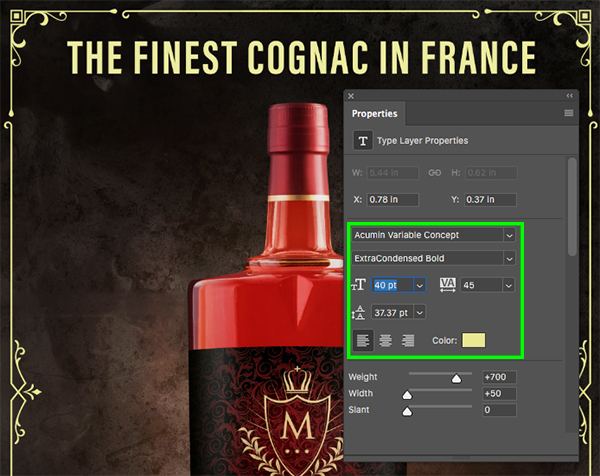 Double click on the duplicate copy of the Cognac Smart Object layer to bring up the Layer Style panel, and then check off the ‘Color Overlay’ option. 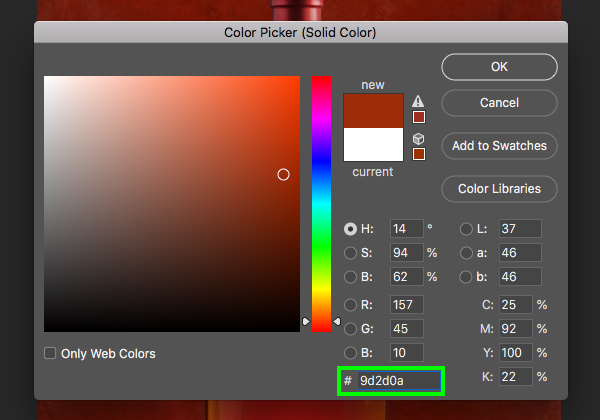 For the fill color, let’s use the hex value ‘#250408’ and then click ‘OK’ to continue. 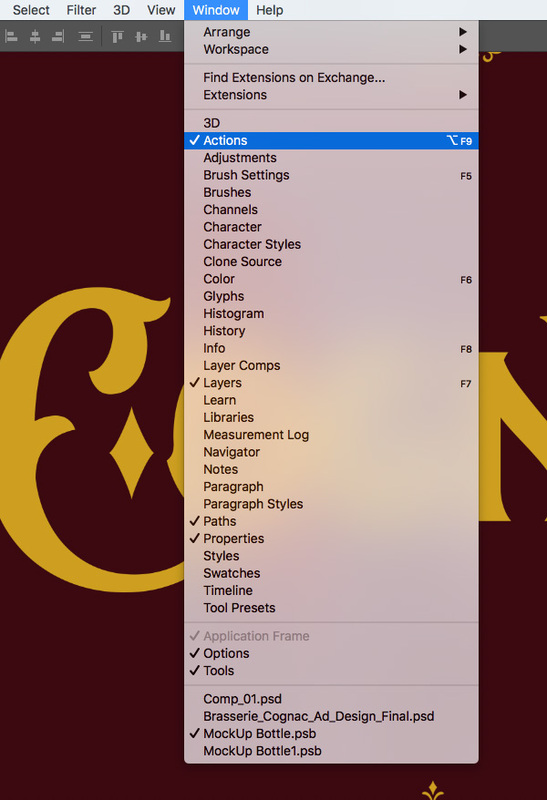 Go to the Window menu and choose ‘Actions’ to open the Actions panel. 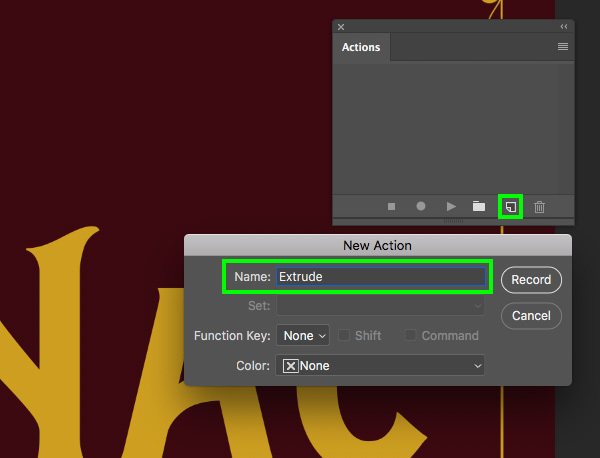 Click on the ‘New Action’ icon at the bottom of the panel and then enter a name for your action – here I am using the name ‘Extrude’. Once you have done that, click on the ‘Record’ button. 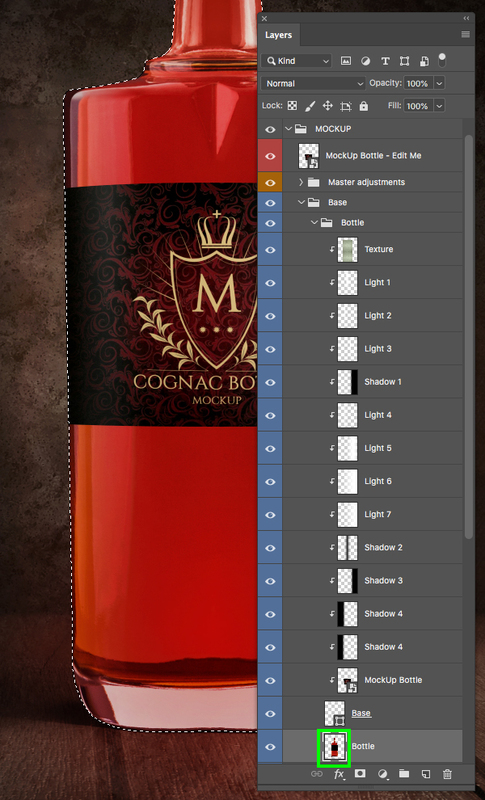 All we are going to do here is select the duplicate Cognac Smart Object layer that we applied a dark red Layer Style to and duplicate it by pressing Command/Ctrl+J. After that, press Command/Ctrl and the left bracket on the keyboard to move the new copy below the previous copy. After that, tap the down arrow once and the right arrow once. From here, click on the stop button in the Actions panel. 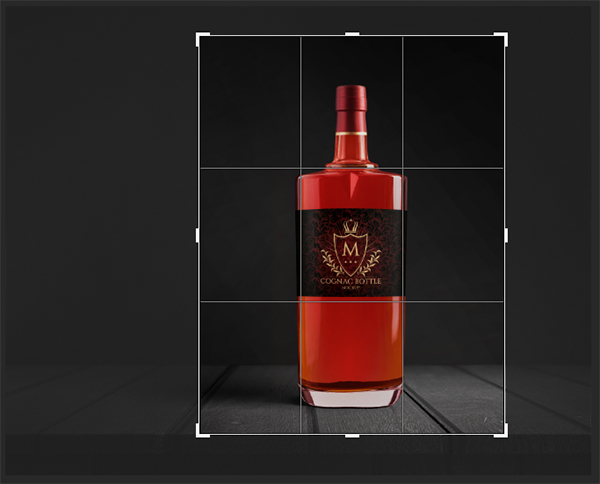 We can now select our most recent copy of the dark red Cognac Smart Object layer and then press the play button in the Actions panel. 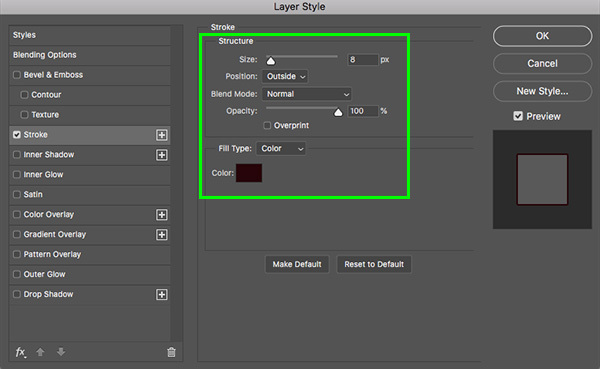 Do this about 34 times until you have a stack of layers. Each time you press play you will notice that it creates a longer drop shadow effect that adds a bit of depth to our text. After placing all of the dark red Smart Objects into the ‘EXTRUDED’ folder, double click on the folder to open the Layer Style panel and then check off the ‘Stroke’ option. 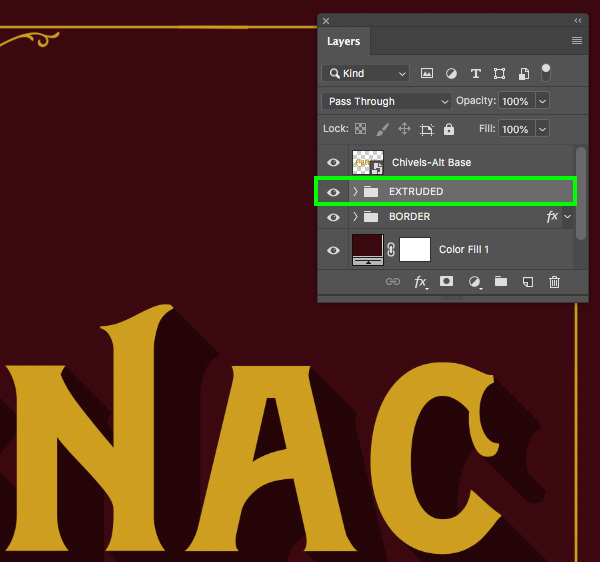 From here, let’s create a stroke with a ‘Size’ of ‘8 px’ set to a ‘Position’ of ‘Outside’ and then click on the ‘Color’ swatch to change the stroke color. 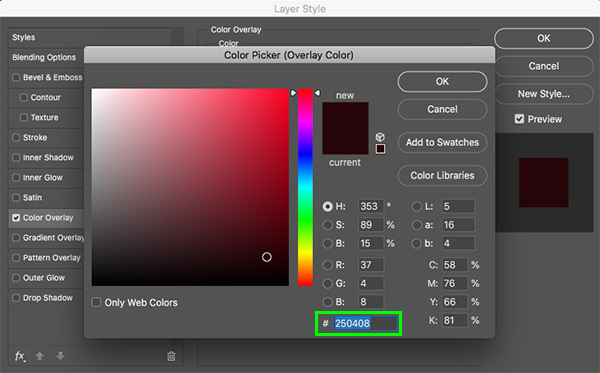 Let’s now change the fill color to ‘#250408’ so that it matches the color of the shadows. Once you have done that, press ‘Return’ or click ‘OK’ twice to apply the changes and close out of both panels. 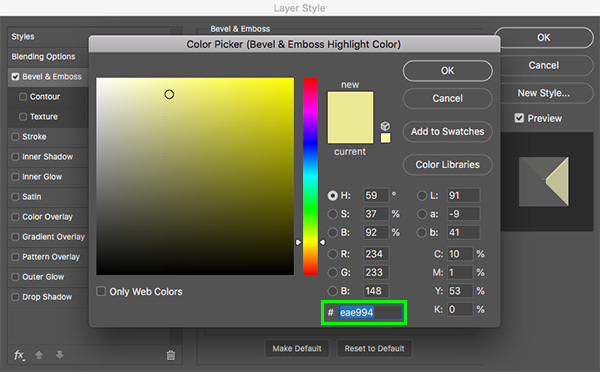 For the ‘Highlight Mode’ color on the bottom, use the hex value ‘#EAE994’ and then click ‘OK’ to close out and continue. 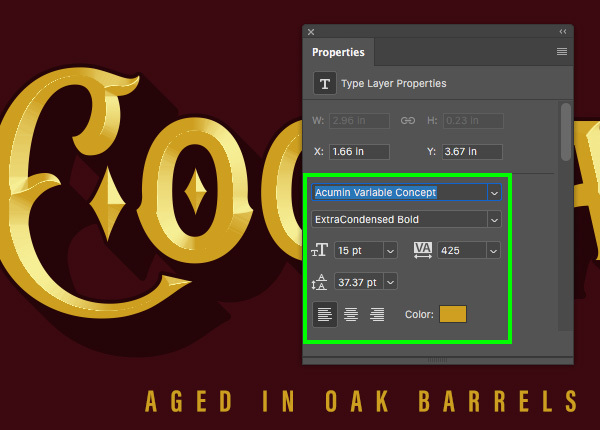 Create a new layer and use the Type Tool (T) to type out the words ‘AGED IN OAK BARRELS’ using the same bold condensed font from earlier – ‘Acumin Variable Concept’. This time I will make the size of the text ’15 pt’ with a tracking setting of ‘425’ to spread the letters out quite a bit. 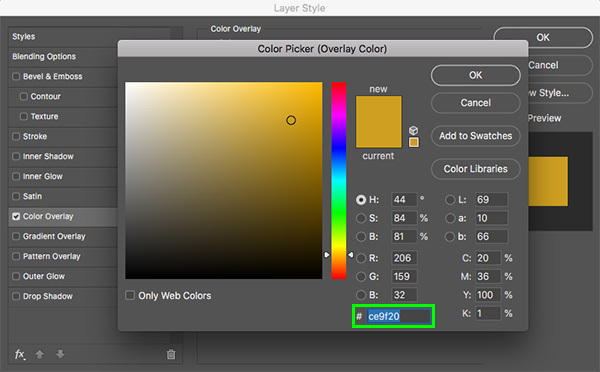 Let’s also use the same gold fill color from before for consistency – ‘#CE9F20’. 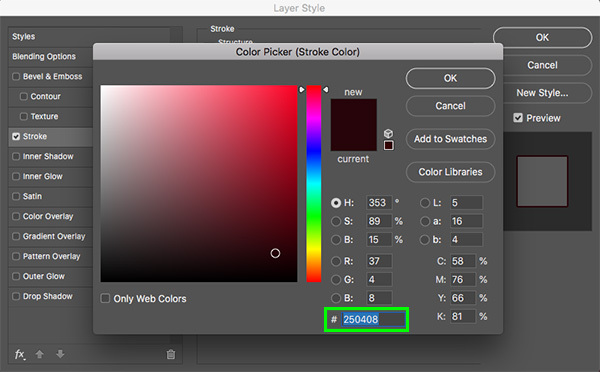 Press ‘U’ on the keyboard to switch to the Rectangle Tool and then set the ‘Stroke’ to ‘4 px’ and click on the color swatch for the stroke. 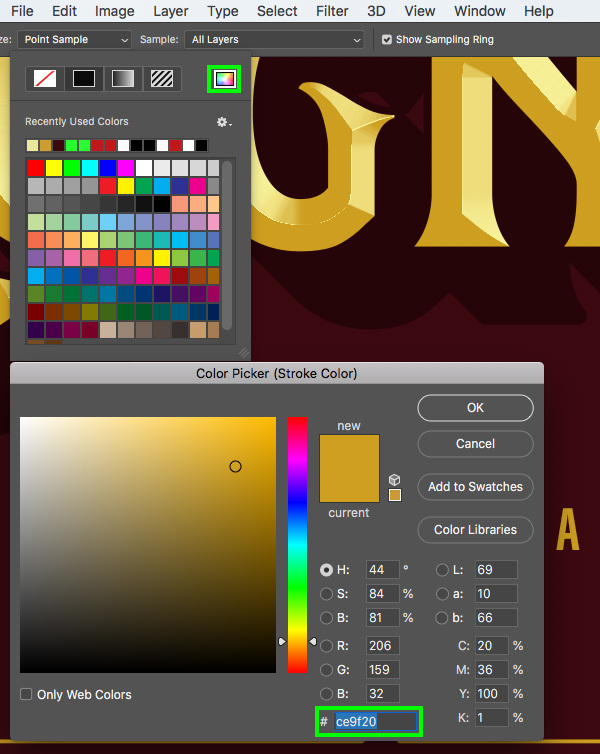 Once you see the swatches, click on the rainbow colored icon in the upper right. From here, enter the hex value ‘#CE9F20’ and then click ‘OK’ to continue. 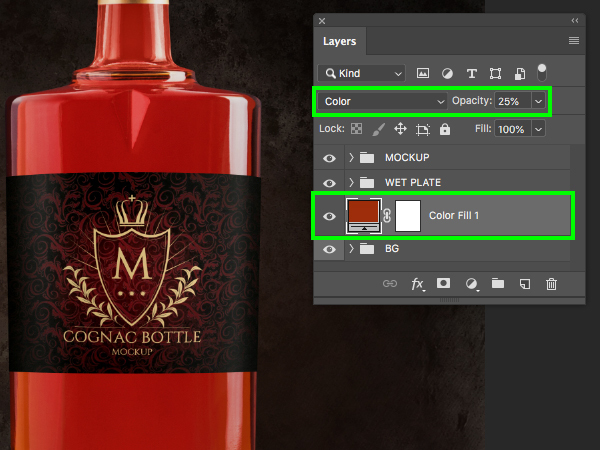 Click inside of the text box to highlight the text and then click on the ‘Create warped text’ icon from the top toolbar to bring up the dialog box. From here, set the ‘Style’ to ‘Arc’ and then apply a horizontal bend of ‘31%’ before pressing ‘Return’ or clicking ‘OK’ to apply the change. 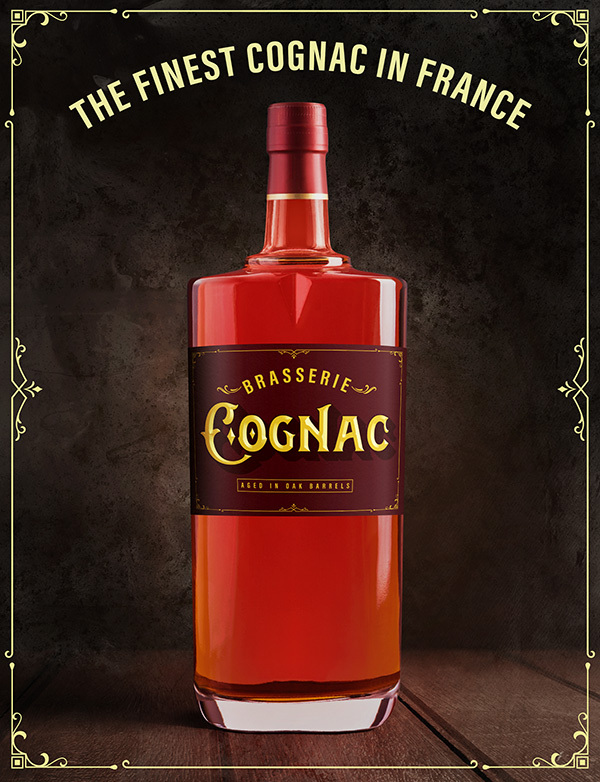 Your text will now arc over the ‘Cognac’ text and match the main headline from the ad. 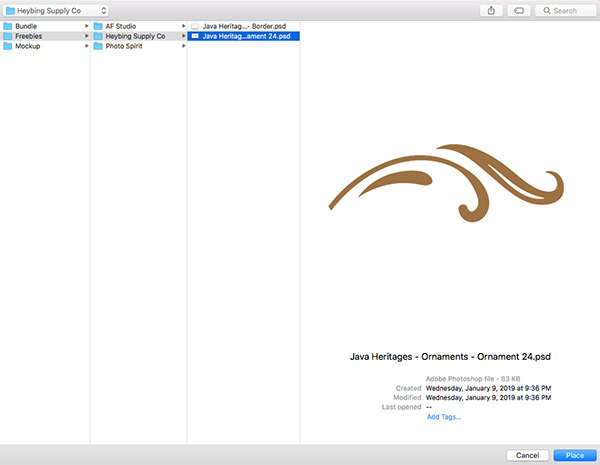 Navigate to the ‘Java Heritages – Ornaments – Ornament 24.psd’ file from Heybing Supply Co in the freebies folder and then choose ‘Place’ from the lower right. 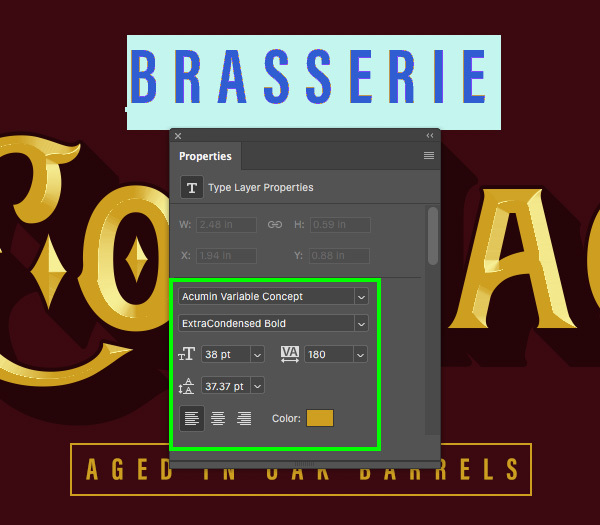 Scale the ornament down by dragging inwards from the upper right corner of the bounding box while holding the Shift key and place it to the right of the ‘BRASSERIE’ text. 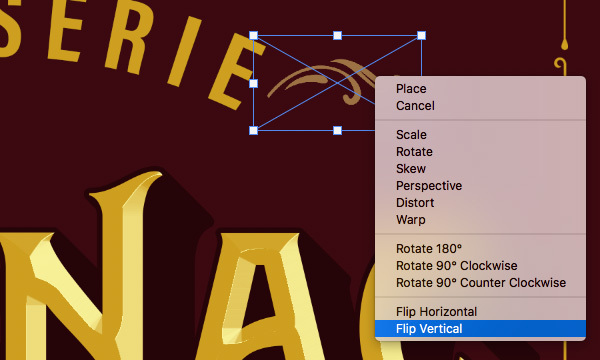 Hold the Control key and click on the ornament and then choose ‘Flip Vertical’ from the dropdown to flip it. 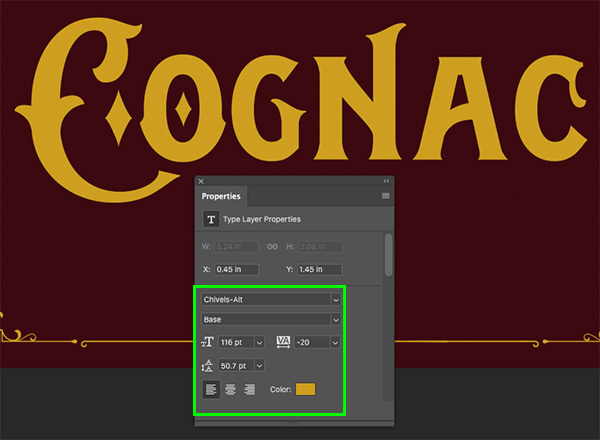 After applying the transformation, double click on the ornament layer to bring up the Layer Style panel and check off the ‘Color Overlay’ option. For the fill color we will once again use the hex value ‘#CE9F20’ and then click ‘OK’ twice to apply the changes and close out. 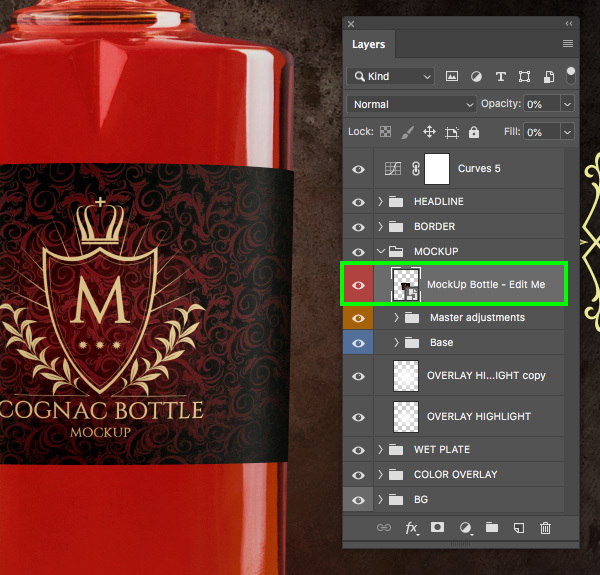 Select the ornament layer and duplicate it by pressing Command/Ctrl+J. After that, press Command/Ctrl+T and then hold the Control key and click on the shape before choosing ‘Flip Horizontal’ to flip the ornament the other way. 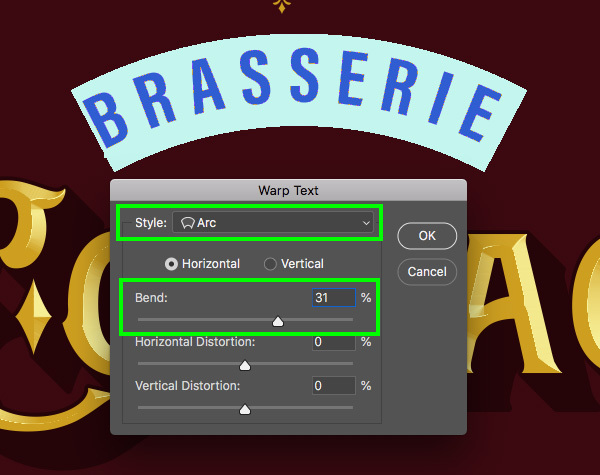 Hold the Shift key and slide the new copy over to the opposite side so that there is an ornament on both sides of the ‘BRASSERIE’ text. 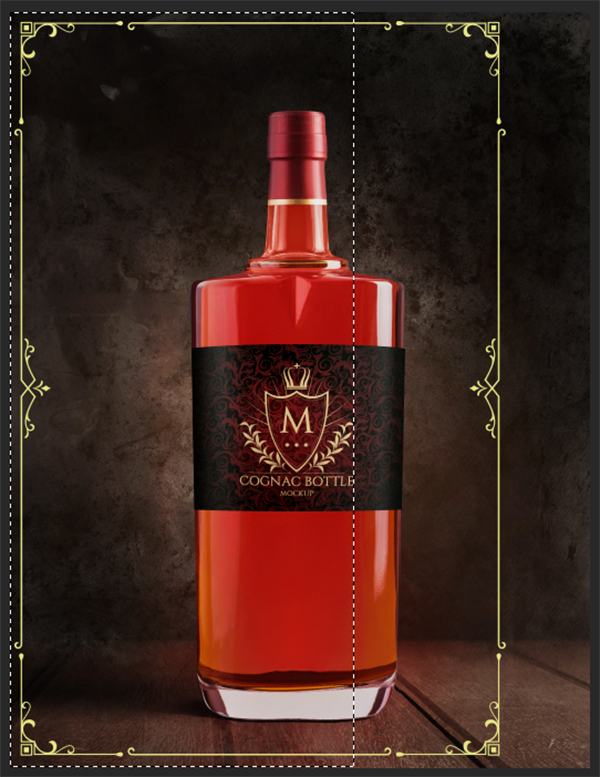 Our label design is now complete! Let’s save the Smart Object by pressing Command/Ctrl+S and then once it has finished saving press Command/Ctrl+W to close the window and return to the main file. 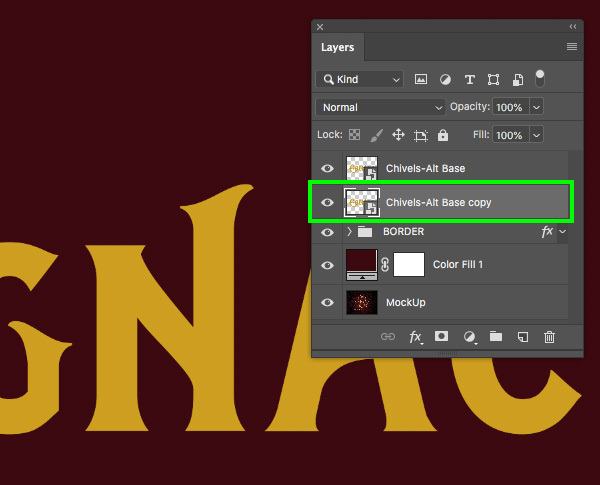 Once you are back in the main mockup file, go into the ‘MOCKUP’ folder and locate the top copy of the ‘OVERLAY HIGHLIGHT’ and press the number ‘5’ on the keyboard to drop the opacity of the layer down to ‘50%’ so that the backlight is a bit less intense. 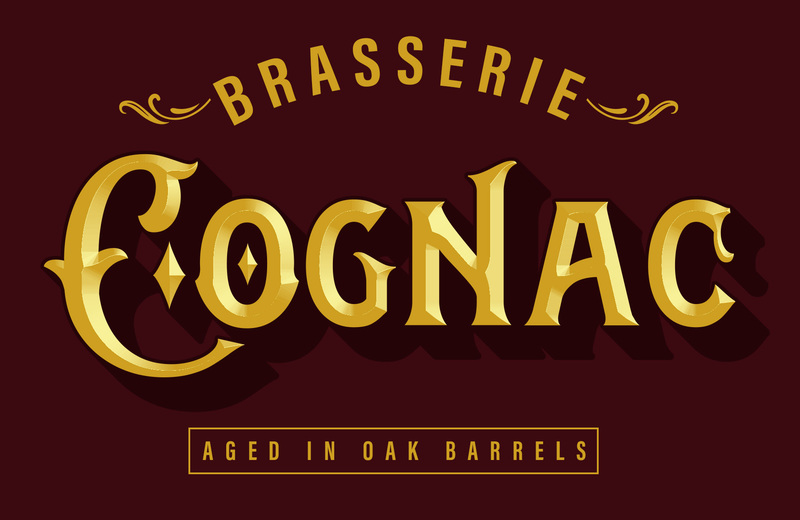 We have now completed our Brasserie Cognac Advertisement! 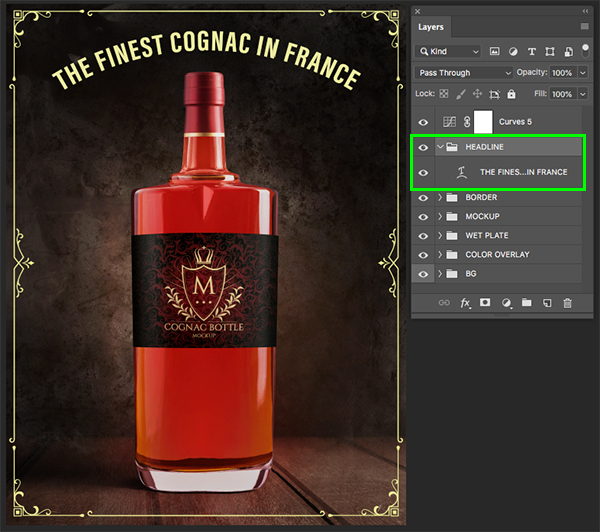 To create our ad we’ve used a small handful of vintage elements including one of several styles of the ‘Chivels’ typeface from AF Studio along with some decorative flourishes and a border from Heybing Supply Co, a worn texture template from Photo Spirit, and a free cognac/whiskey bottle mockup. 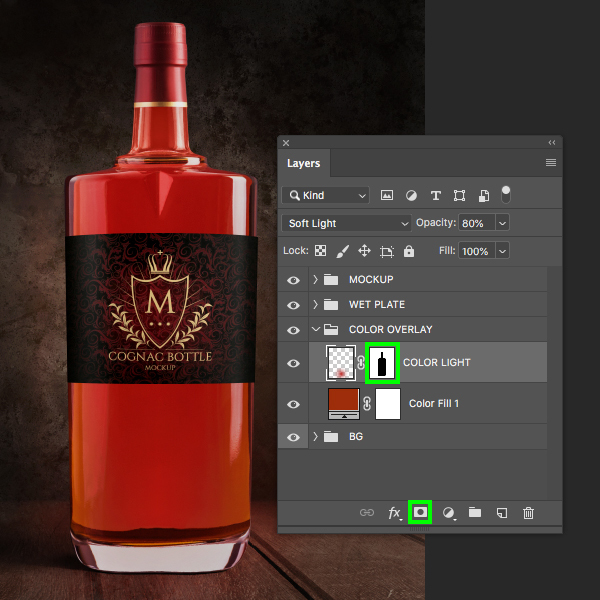 The resources we have used today are just a small sample of the stunning array of tools and graphics that will give your projects an authentic feel in minutes! There’s still time to check out The Creative’s Ultimate Vintage Collection featuring retro fonts, beautifully preserved illustrations, vintage papers, effects, textures, and so much more all for an unbeatable price of $29! I love all of your tutorials! The only time I got tripped up in this one is when I went looking for the Chivels-Alt font (in the tutorial text it says “Chisels-Alt”- typos happen!). 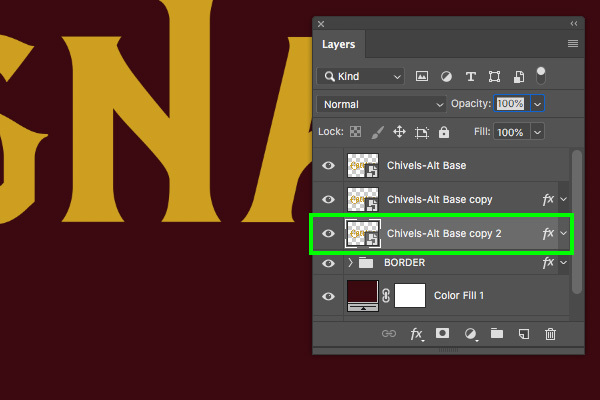 The only font included in the download for the tutorial is Chivels-Base. I have the The Creative’s Ultimate Vintage Collection (amazing btw!) so I was able to find and use the alt font, but maybe clarify in the text that the Chivels-Alt font is not in the free download just to avoid confusion about why it doesn’t look the same 🙂 Thanks! Wow thank you so much for your lovely comment- it is awesome to hear you are loving our tutorials and we would love to see any of your finished results if you were keen to share! Thank you so much for flagging this with me and I have corrected the typo now in the tutorial write up- we really appreciate you letting us know so as to avoid any confusion for anyone else- whew you are a star 🙂 I am just looking into the inclusion of Chivel Base over Alt and once I confirm with the team, I will get this changed out as well- thanks Karina! Thanks so much for your kind words- they are hugely appreciated! 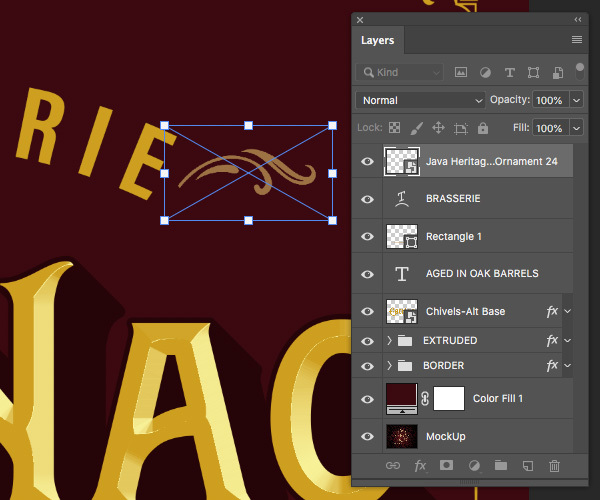 This is a great example of how to create something special using a (generously designer-shared) freebie mockup with beautiful type, and well-created textures, etc. The possibilities are endless! Thank you Design Cuts! We would love to see anything you create yourself using any of your DC resources so please do feel free to share any of your work, if you were keen to! Thanks for these tutorials! They’re ALWAYS helpful to pick up different techniques and see possibilities. Thank you so much for taking the time to comment and this comment has actually made our day 🙂 We are so happy to hear that you are enjoying the tutorials and please do let us know if there is anything you would love to see featured in a tutorial! 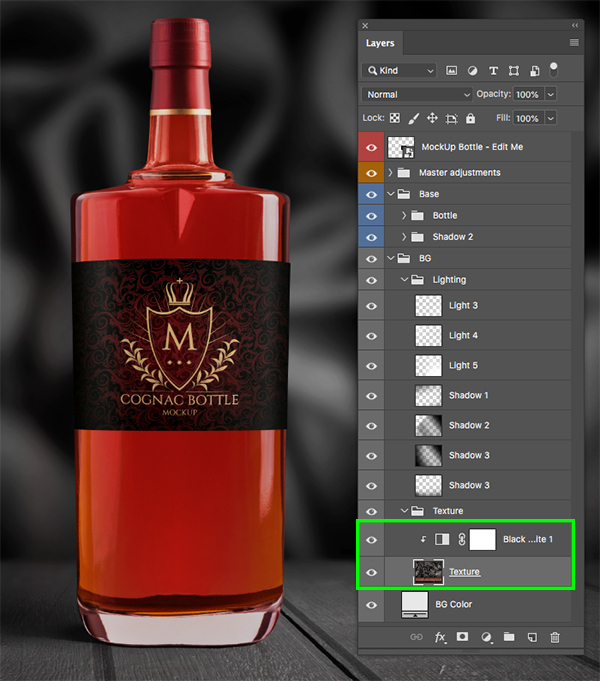 Thank you so much for commenting and we are so sorry to hear that this bottle mockup freebie is not quite what you are looking for for your own projects! We would be happy to help you find the perfect resources for your projects Kimmo. If there is anything in particular you are looking for please let us know- we are always happy to help!